TVs were, in days gone by, the staple of CES. Since flat panels started to take over the world in the mid-2000s you could be sure everyone would have a new TV range to launch. Journalists would sit through lists of new TV ranges with absurd model numbers with each adding new and exciting features. It's not quite like that any more. These days it seems that there are shorter lists and fewer brand new features, but that's not to say that huge advances aren't being made, because they most certainly are. Let's have a look at some of the biggest buzzwords from CES this year and work out where our TV voyage will take us this year. This tech has been bubbling under the surface for some considerable time now. There are already TVs out there that can display HDR images, but this year will see Netflix add support for the format along with the new 4K Blu-ray system, which will also allow HDR TVs to show breathtaking movies and TV shows in the format. High Dynamic Range - if you don't know - is a way of delivering more detail pictures even when there's very high contrast. Usually this would mean that either dark areas lack detail, or bright ones appear washed out. HDR gives you detail in both light and dark areas, and that's amazing for giving your eyes a more realistic experience. HDR causes as many problems as it solves, it seems, because there are also two competing standards in the technology. Dolby Vision is, as the name suggests, backed by Dolby. This is the format used for Star Wars and if you want to see that movie, on a TV, in HDR then you'll need a compatible one. In the UK that means LG, while other countries get TCL and Vizio sets to quench their thirst. And then we've got Philips and Technicolor joining forces to bring another new HDR format to our screens this year too. The alternative is HDR10, which uses slightly different methods to Dolby's. Now, this isn't like Dolby Digital vs DTS, both formats could go on one disc or stream, but why do we always have to have this absurd level of complication in home cinema. It adds nothing to anyone's lives but misery and confusion. Will this become a big problem for the HDR? It might do if loads of TVs get sold which don't support Dolby Vision and that format ends up being more widely adopted. If there's customer confusion about this though, it could really hurt sales. On the Sony stand was one very interesting demo. In it there was a standard TV and one using Sony's Backlight Master Drive. Both TVs were given the same footage, but the HDR, which pushed through the Backlight Master Drive was staggering. On bright scenes it felt like your retinas were being seared by the light pouring out of this TV. In the demo footage this meant that it was very much like being present in the helicopter hovering over New York. Technically impressive though it is, it's possible such things might end up being a little bit irritating when you're watching at home. Do we need to start wearing sunglasses to watch movies set in the desert? That Sony TV had a peak output of 4000nits. Samsung was talking about nits too - it talked about having 1000. These are not the creatures you might have dealt with when you were at school, but a measure of brightness. For some reason the word nits has become popular this year, but previously everyone was perfectly measuring brightness in Candela per square metre or cd/m2. Nits comes from the word nitere which means "to shine". The internationally standard measure for brightness is cd/m2 though, so let's just keep using that, eh? Players - which were promised last year - are now starting to get priced. Samsung's seems to be cheapest at around $400 while Panasonic threw its model on the market at $1000 and hoped no one noticed. As with any new format the initial players are the ones where you'll make a healthy profit margin. Sadly there's not a lot in Ultra HD Blu-ray players that should push the cost up so high. Apart from greed, obviously. The problem for this format is, though, that if it's too expensive people just won't bother and they'll stream instead. That's okay if you aren't after the best quality, but even on a good day Netflix and Amazon Instant Video don't deliver anywhere near the same picture quality as a disc format does. You probably don't yet have a 4K TV but even so it's obsolete before you've even paid for it and taken it home. We joke, because while the 8K format is a reality already, and tests are taking place, it's not going to be a consumer format any time soon. In production 8K has some uses, for example Sony's latest digital cinema cameras shoot an 8K format which is used for archiving. A 4K master is taken from that raw footage, and used for movie prints, but there will be extra data kept which might be used at some point in the future. Of course there will eventually be 8K broadcasts, and the Japanese are keen to use the format for certain events. 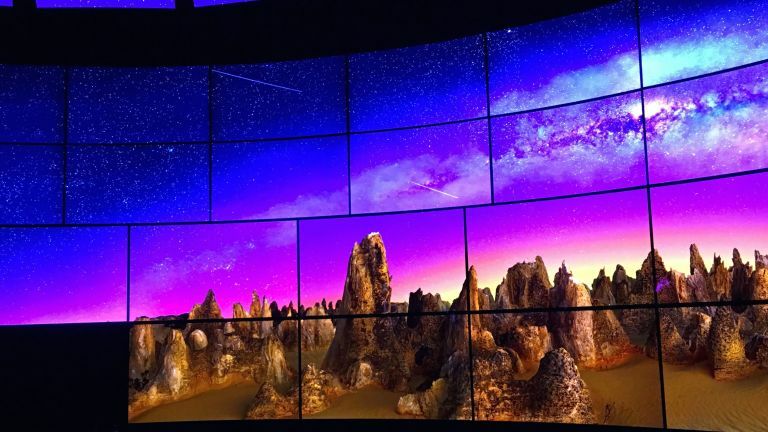 LG and Samsung both showed off 8K panels at CES, and as impressive as they are no one really has the head-space to consider them until we're all bored of 4K and HDR - likely next year for CES 2017. Here's one important takeaway from CES this year - only LG can make large OLED TVs. This seems to be something that's going to carry on for a while, but the Korean firm has been the only consistent place to buy one of these fantastic TVs. Meanwhile Sony, Samsung and Panasonic all keep pushing their LCD screens and adding new features. None of this is bad, and to be fair LCDs are a lot better now thanks to technologies like Quantum Dots, which give blacker blacks and brighter colours. As with all format wars there are those who say that OLEDs still have long-term problems, namely with the blue pixels which last the least number of hours in a panel. But to counter that of course is the argument that no LCD, no matter how good, can beat the black levels and contrast of an OLED TV. It's all frankly tedious tech one-upmanship, but for now LCD remains the dominant fomat. It's cheaper to produce and has most of the features you're likely to want. LG is now offering HDR on its OLEDs though, so there's no single thing that makes for a clear winner. Samsung really wanted to push its reduction in bezez size at CES this year. For old-timers who remember Toshiba's amazing LCD screens with thin frames this might seem like less of an achievement, but Samsung certainly has managed to substantially cut down on the amount of black plastic that surround the TV itself. Why is this important? Well, it gives you a nicer piece of tech from your living room. Take a look at an old Pioneer Kuro and you'll see that small bezels mean that you can get a 55- or even 60-inch TV in the space taken up by an older plasma screen. Some people perhaps don't realise that an OLED is naturally transparent, and this means it's quite possible to have TVs and monitors that are transparent when not displaying an image. This is a piece of tech that manufacturers love to show off at trade shows because it looks cool. When it comes to your main TV though the last thing you really want is a transparent TV - who wants to see the mess you usually hide behind your telly? Where this might have applications in the future though are more commercial applications. It adds nothing in practical terms of course, and could even be considered in the same breath as rollable OLED panels. Let's not forget Samsung put a TV on a fridge. Bonkers.